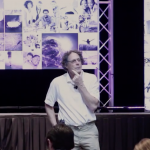 “My best friend in the world stopped being my friend,” begins Fred Luskin, Ph.D. as he tells his journey of studying, researching and becoming a leader in the field of forgiveness. Dr. Luskin explores how people naturally react when they’re hurt and how we can begin to recover from conflict. To learn how and why forgiveness can be surprisingly good for one’s health. Dr. Luskin is the author of the best seller “Forgive for Good: A Proven Prescription for Health and Happiness and Stress Free for Good.” Dr. Luskin’s work has been featured in Time magazine, O magazine, Ladies Home Journal, U.S. News and World Reports, Parade, Prevention as well as the New York Times, Los Angeles Times, Chicago Tribune, U.S.A. Today and the Wall Street Journal. Dr. Luskin is the Director of the Stanford University Forgiveness Projects and an Associate Professor at the Institute of Transpersonal Psychology.